Somerset 2 pass with Metallic Rollers, Side Operation! Ergonomic design makes it easy to make 500+ pieces per hour. The Most Advanced side Operation, compact sheeter. Pizza, Rolled in Dough, Cookies, Sheeting, Pita bread, Pie Crusts, Flour Tortilla's, Sweet Dough's, Cal zones, Cinnamon Rolls, Pierogi, FOCACCIA, pasta. USDA & NSF Approved, UL, CE, SA Listed. Safety Sensors for Automatic Shutoff. Compact Design, ideal for limited space! 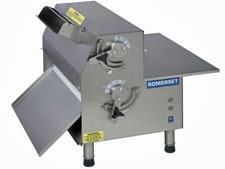 Sanitary, Heavy Duty, all Stainless Steel welded Construction. Spring Loaded scrapers, removable for easy cleaning. Large Hopper accepts large pieces of Dough. Safe, Simple, Easy to operate, easy to clean. 3.5" dia, by 20" length. Sealed Ball Bearing, permanently lubricated. Heavy duty gear motor 3/4 H.P. Single phase, 115 volts, 60 hz, or 220 volts, 50 hz. Shipping weight is 205 lbs.